Lynn Salloum has always had a passion for architecture, design and assisting others. 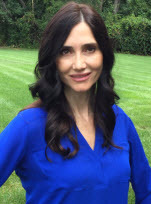 She graduated from Wayne State University in 1990 with a Bachelor of Science in Nursing Degree and in 1993 with a Master of Science in Nursing Degree. Lynn had a very fulfilling career as a Registered Nurse for 15 years. She left the profession to raise her children. In the meantime, her husband, Paul, became involved in building and developing residential subdivisions. As soon as their children were both in High School, Lynn achieved her Real Estate Agent License and proceeded to join the family business. Lynn has been listing and selling new construction homes since August 2015. She is very enthusiastic about the residential building process and enjoys helping her clients through every step of the way. Watching her clients� ideas and desires come to life as the home of their dreams is very fulfilling and rewarding to Lynn. Lynn is very dedicated to her clients, promptly responds to their needs and treats them the way she would like to be treated. She has lived in the Plymouth/Canton area for the last 24 years with her husband and two teenagers. Lynn is a marathon runner and enjoys designing and creating jewelry.